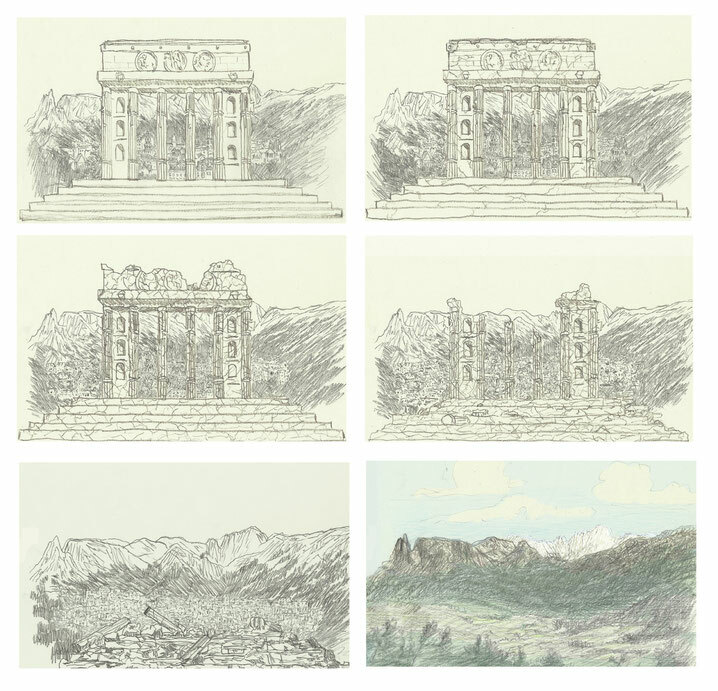 These drawings came to life following a profound reflection and thorough discussion on the city of Bolzano, place of birth of Gianni Pettena, with Pierre Bal-Blanc, curator of the exhibit Soleil Politique at the Museion, in that same city. Hence, the memories and sensations generated during his childhood and adolescent years by that urban environment resurfaced, because it had appeared to him vaguely metaphysical, at least in its Piacentinian and celebrative part imposed by the Fascist regime. In those memories, the city was nonetheless always the stage in front of a mountain background, a context familiar to him and one that had fascinated him since his youth, a fascination that persisted even when, over the years to come, he would learn to better comprehend the meaning of the urban setting. And although in time he has come to understand that the city also interprets history, and that architecture expresses messages and ideologies, this has but reinforced his conviction that the presence and power of Nature are always on the winning end of the encounter. With the passing of millennia everything may disappear and only traces remain of the fabric of previous cultures, superimposed one on the other, but in the end, Nature re-elaborates and recovers its role, prevailing in the end over the small quarrelsomeness of centuries: Nature recounts the millennia, the thousands, the millions of years.